The new Skeeter Beene’s Car Care Center website is mobile-friendly and easy to navigate. The top navigation and large call-to-action buttons make it easy to find what you are looking for with a click of a mouse. We also added a parts request form for those searching for a specific part. Skeeter Beene's CAR CARE CENTER has been providing quality car care in Melbourne and Izard County for many years. 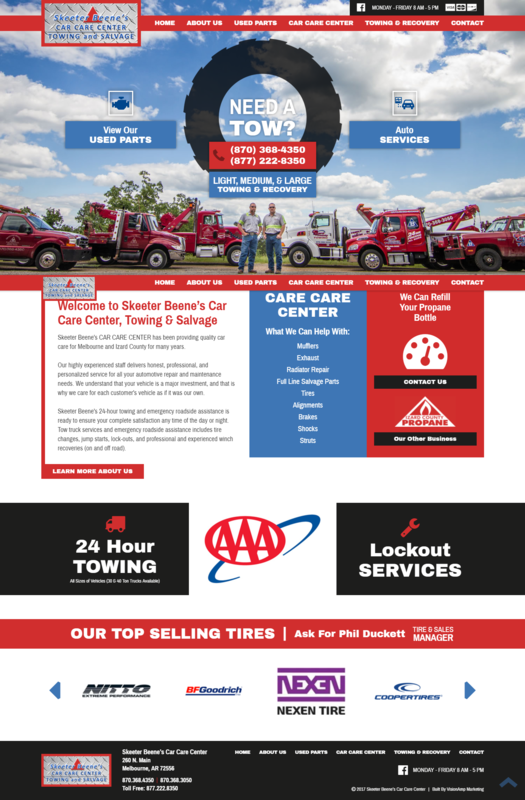 Skeeter Beene's offers 24-hour towing and emergency roadside assistance which includes tire changes, jump starts, lock-outs, and professional and experienced winch recoveries (on and off road). They also offer used car parts and auto services.